“The Indian Academy, Dubai” has partnered with Gulf Pinnacle Transport LLC for provisioning transport service to our students. Gulf Pinnacle Transport (GPT) (www.gulfpinnacletransport.com) is strongly committed towards providing quality transport service by maintaining the highest level of safety, outstanding customer service and positive employee relations. They take great pride in bringing international best practices and technology to support education by making sure children have safe, comfortable and reliable transportation to the School and back home. The drivers of GPT and female bus attendants of the school are trained to follow the safety standards as per the requirements of The Indian Academy Dubai, GPT and Road & Transport Authority, Dubai. All the buses will be mounted with cameras with multi-angle views. The digital recordings will be secured and will be shared with School administrators to analyze incidents and support disciplinary action. The technological measures include electronic attendance and Parents App where the student attendance is captured on real-time; parents get real-time notification of students movement in and out of the school bus. GPT had developed a comprehensive preventive maintenance program for its vehicles which is essential to the safe and efficient operation of the School Buses. The program reduces vehicles breakdowns, accidents due to faulty equipment, lowers maintenance cost and enhances safety in School buses. 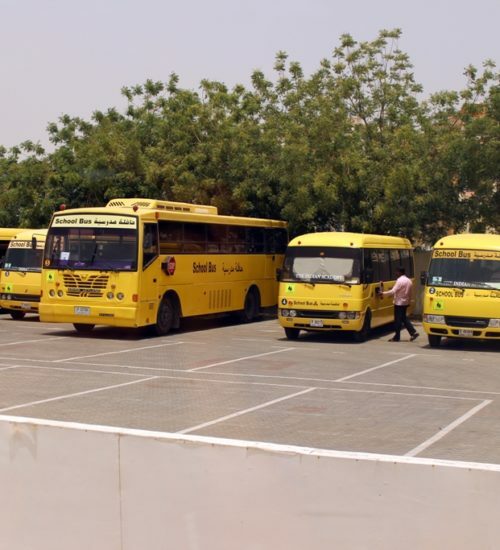 The drivers of GPT and female bus attendants of the school are trained to follow the safety standards as per the requirements of The Indian Academy Dubai, GPT and Road & Transport Authority, Dubai. Payment can be made in cash or by cheque (made payable to Gulf Pinnacle Transport LLC) to the GPT desk in the School which will remain open from Sundays – Thursdays from 8:15 AM – 1:30 PM. Payments through credit card facility will be made available to the parents from second week of September 2017. The students are expected to wear their bus/ID cards regularly. At the time of boarding, please ensure that your child does not move towards the bus until it comes to a complete stand still. Parents are requested to bring their wards to the bus pick-up point in time and make provision to receive them in time, at the time of Drop-off. Students are not allowed to stand or run in the bus while travelling. Chewing gum is not allowed while travelling in the school bus. Changes in Pick-up or Drop-off points will be accepted only on prior written permission. Kindly send a note to the administrative office. The school holds the right to request students not to use the transport in case of misbehaviour in the bus. Use of foul language will be treated as a serious misconduct. Instructions by the Teachers travelling in the bus should be strictly followed. The bus attendants and the drivers are fully authorized to guide your child inside the bus as well as report to the school office if your child is not following the above guidelines. The school will not allow such students to travel in the bus.